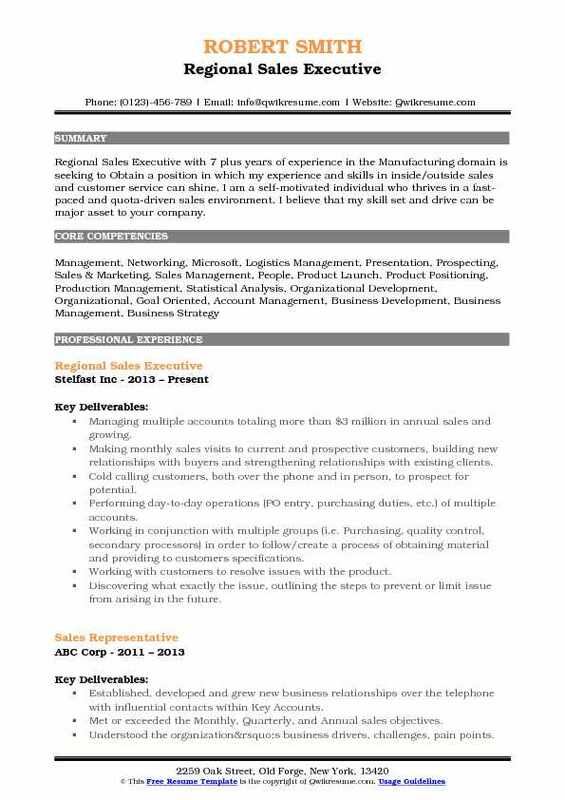 The Regional Sales Executive is accountable for selling the businesses products and services within a specified geographical area. 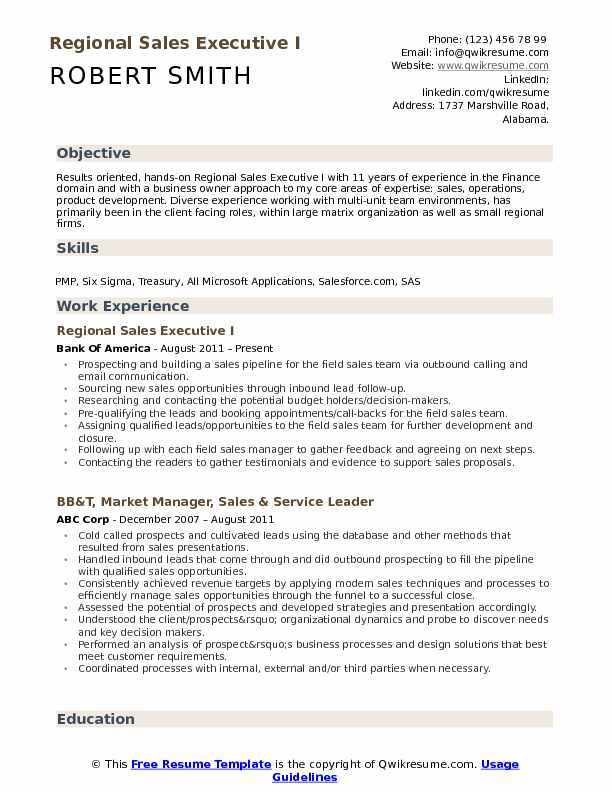 Essential duties mentioned on the Regional Sales Executive Resume are collaborating with senior management team to execute sales goals for the assigned region, managing the sales team and maximizing sales revenue of the firm, identifying customers, reporting on regional sales statistics, assessing the area’ needs and preferences, selling the product through various selling modes and discovering new opportunities for growth. The key requirements normally expected by the hiring employers are – great communication skills, organizational skills, proficiency in key performance metrics preferably ROI and KPI’s; CRM knowledge, understanding of stores operations, availability to travel and motivating skills. Most of the eligible resumes make a display of a degree in sales or business administration. Summary : Results oriented, hands-on Regional Sales Executive I with 11 years of experience in the Finance domain and with a business owner approach to my core areas of expertise: sales, operations, product development. Diverse experience working with multi-unit team environments, has primarily been in the client facing roles, within large matrix organization as well as small regional firms. Prospecting and building a sales pipeline for the field sales team via outbound calling and email communication. Sourcing new sales opportunities through inbound lead follow-up. Researching and contacting the potential budget holders/decision-makers. Pre-qualifying the leads and booking appointments/call-backs for the field sales team. 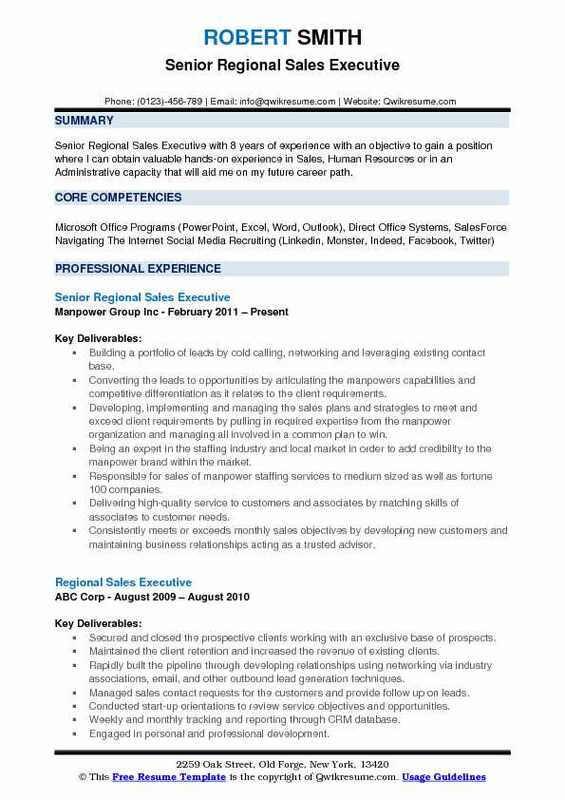 Assigning qualified leads/opportunities to the field sales team for further development and closure. Following up with each field sales manager to gather feedback and agreeing on next steps. Contacting the readers to gather testimonials and evidence to support sales proposals. Acting as a bridge between marketing and sales. Liaising with the marketing teams on campaign activity to generate leads and improve the quality of leads. Recording the conversations with prospects on the CRM system for reporting purposes. Manage and contribute to the development of short and long term strategic plans by country corridor in south texas. 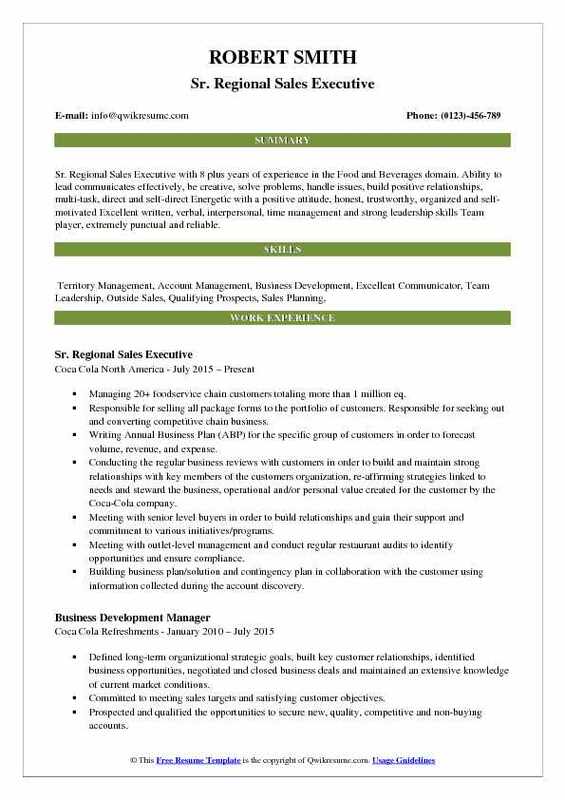 Summary : Senior Regional Sales Executive with 8 years of experience with an objective to gain a position where I can obtain valuable hands-on experience in Sales, Human Resources or in an Administrative capacity that will aid me on my future career path. Building a portfolio of leads by cold calling, networking and leveraging existing contact base. Converting the leads to opportunities by articulating the manpower's capabilities and competitive differentiation as it relates to the client requirements. Developing, implementing and managing the sales plans and strategies to meet and exceed client requirements by pulling in required expertise from the manpower organization and managing all involved in a common plan to win. Being an expert in the staffing industry and local market in order to add credibility to the manpower brand within the market. Responsible for sales of manpower staffing services to medium sized as well as fortune 100 companies. Delivering high-quality service to customers and associates by matching skills of associates to customer needs. Consistently meets or exceeds monthly sales objectives by developing new customers and maintaining business relationships acting as a trusted advisor. Summary : Sr. 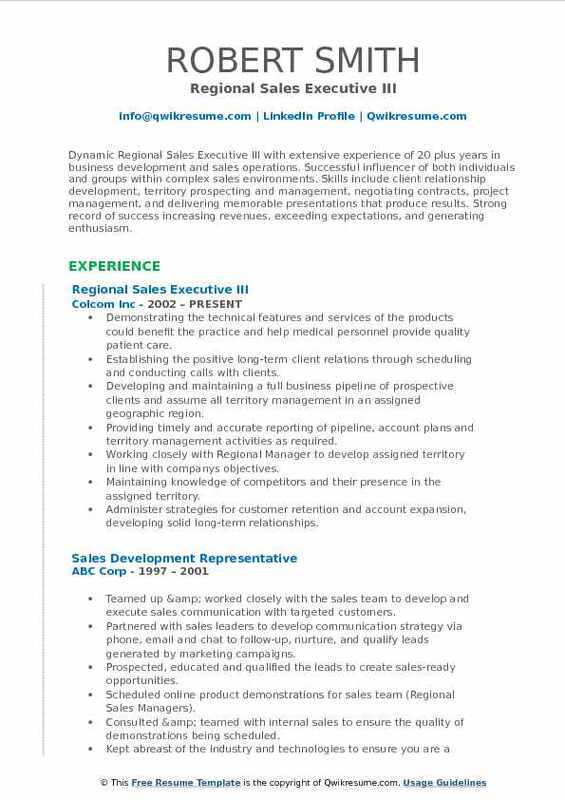 Regional Sales Executive with 8 plus years of experience in the Food and Beverages domain. Ability to lead communicates effectively, be creative, solve problems, handle issues, build positive relationships, multi-task, direct and self-direct Energetic with a positive attitude, honest, trustworthy, organized and self-motivated Excellent written, verbal, interpersonal, time management and strong leadership skills Team player, extremely punctual and reliable. Managing 20+ foodservice chain customers totaling more than 1 million eq. Responsible for selling all package forms to the portfolio of customers. Responsible for seeking out and converting competitive chain business. Writing Annual Business Plan (ABP) for the specific group of customers in order to forecast volume, revenue, and expense. Conducting the regular business reviews with customers in order to build and maintain strong relationships with key members of the customers organization, re-affirming strategies linked to needs and steward the business, operational and/or personal value created for the customer by the Coca-Cola company. Meeting with senior level buyers in order to build relationships and gain their support and commitment to various initiatives/programs. Meeting with outlet-level management and conduct regular restaurant audits to identify opportunities and ensure compliance. Building business plan/solution and contingency plan in collaboration with the customer using information collected during the account discovery. Summary : Dynamic Regional Sales Executive III with extensive experience of 20 plus years in business development and sales operations. Successful influencer of both individuals and groups within complex sales environments. Skills include client relationship development, territory prospecting and management, negotiating contracts, project management, and delivering memorable presentations that produce results. Strong record of success increasing revenues, exceeding expectations, and generating enthusiasm. Demonstrating the technical features and services of the products could benefit the practice and help medical personnel provide quality patient care. Establishing the positive long-term client relations through scheduling and conducting calls with clients. Developing and maintaining a full business pipeline of prospective clients and assume all territory management in an assigned geographic region. Providing timely and accurate reporting of pipeline, account plans and territory management activities as required. Working closely with Regional Manager to develop assigned territory in line with company's objectives. Maintaining knowledge of competitors and their presence in the assigned territory. Administer strategies for customer retention and account expansion, developing solid long-term relationships. Summary : Regional Sales Executive with 18 plus years of experience is interested in sales and customer service industry positions. Excellent communications skills able to establish a solid trust with clients quickly. Set up meetings with district superintendents, board members, high school principals, teachers, coaches and parent volunteer groups. Managed the implementation and kicked off meetings for entire high school staff. On a daily basis tracked the sales calls and leads through sales force and Microsoft Outlook. Built and maintained a power point presentation as the company made product changes as its programs evolved. Bought and sold multi-acre properties, implemented infrastructure on those properties such as grading and compacting building sites, pulling permits, installing septic and well implements, electrical to building sites etc. Managed and worked trades personally start to finish in new home construction. Managed and worked all phases of remodeling construction, working with home-owners on plans, scheduling, change orders and final walk through. Managed on-site 3-8 employees daily and working with subcontractors. Projects completed on time in excess of $10 million with a satisfied customer base and a spotless safety record. 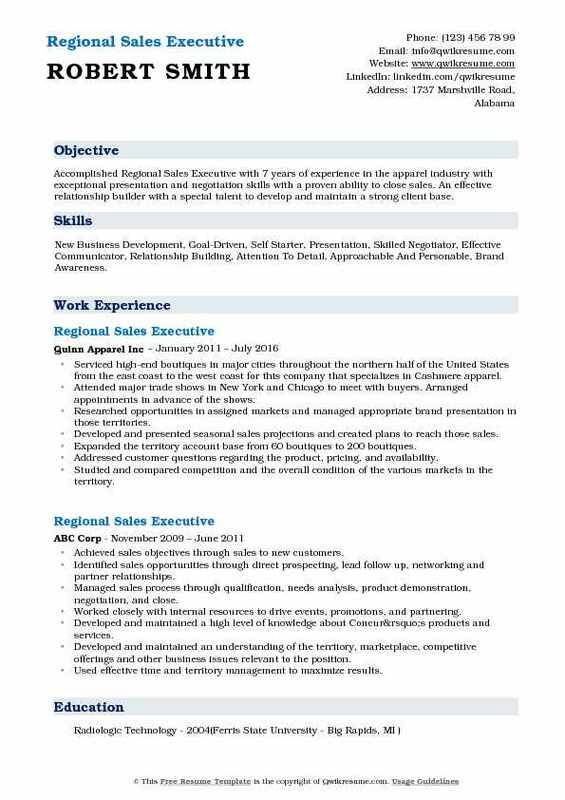 Summary : Accomplished Regional Sales Executive with 7 years of experience in the apparel industry with exceptional presentation and negotiation skills with a proven ability to close sales. An effective relationship builder with a special talent to develop and maintain a strong client base. Skills : New Business Development, Goal-Driven, Self Starter, Presentation, Skilled Negotiator, Effective Communicator, Relationship Building, Attention To Detail, Approachable And Personable, Brand Awareness. Serviced high-end boutiques in major cities throughout the northern half of the United States from the east coast to the west coast for this company that specializes in Cashmere apparel. Attended major trade shows in New York and Chicago to meet with buyers. Arranged appointments in advance of the shows. Researched opportunities in assigned markets and managed appropriate brand presentation in those territories. Developed and presented seasonal sales projections and created plans to reach those sales. Expanded the territory account base from 60 boutiques to 200 boutiques. Addressed customer questions regarding the product, pricing, and availability. Studied and compared competition and the overall condition of the various markets in the territory. Assisted customer service with the collection of payments from slow paying accounts. Assisted customers with effective presentation and marketing of the brand. Prepared presentations, proposals, and sales contracts for existing and potential accounts. 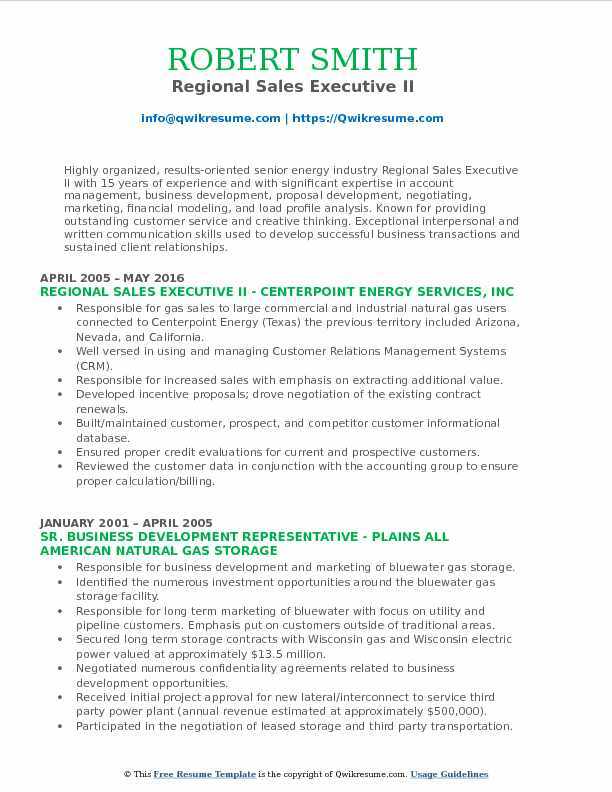 Summary : Highly organized, results-oriented senior energy industry Regional Sales Executive II with 15 years of experience and with significant expertise in account management, business development, proposal development, negotiating, marketing, financial modeling, and load profile analysis. Known for providing outstanding customer service and creative thinking. Exceptional interpersonal and written communication skills used to develop successful business transactions and sustained client relationships. Responsible for gas sales to large commercial and industrial natural gas users connected to Centerpoint Energy (Texas) the previous territory included Arizona, Nevada, and California. Well versed in using and managing Customer Relations Management Systems (CRM). Responsible for increased sales with emphasis on extracting additional value. Developed incentive proposals; drove negotiation of the existing contract renewals. Built/maintained customer, prospect, and competitor customer informational database. Ensured proper credit evaluations for current and prospective customers. Reviewed the customer data in conjunction with the accounting group to ensure proper calculation/billing. Established working relationships with the various LDC account managers while maintaining a thorough knowledge of the various LDC tariffs. Assisted the customers as needed with their LDCs. Collaborated with internal sales personnel as needed to coordinate RFPs/contracts across sales regions. Summary : Regional Sales Executive with 7 plus years of experience in the Manufacturing domain is seeking to Obtain a position in which my experience and skills in inside/outside sales and customer service can shine. I am a self-motivated individual who thrives in a fast-paced and quota-driven sales environment. I believe that my skill set and drive can be major asset to your company. Managing multiple accounts totaling more than $3 million in annual sales and growing. Making monthly sales visits to current and prospective customers, building new relationships with buyers and strengthening relationships with existing clients. Cold calling customers, both over the phone and in person, to prospect for potential. Performing day-to-day operations (PO entry, purchasing duties, etc.) of multiple accounts. Working in conjunction with multiple groups (i.e. Purchasing, quality control, secondary processors) in order to follow/create a process of obtaining material and providing to customers specifications. Working with customers to resolve issues with the product. Discovering what exactly the issue, outlining the steps to prevent or limit issue from arising in the future. Achieved proficiency in all aspects of consulting/managing international employees. Worked exclusively with domestic and international companies to expand their global footprint. 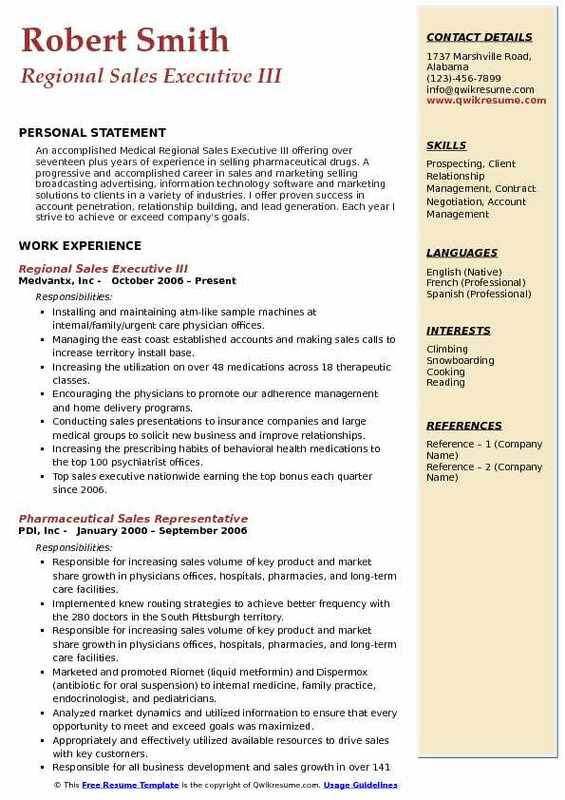 Summary : An accomplished Medical Regional Sales Executive III offering over seventeen plus years of experience in selling pharmaceutical drugs. 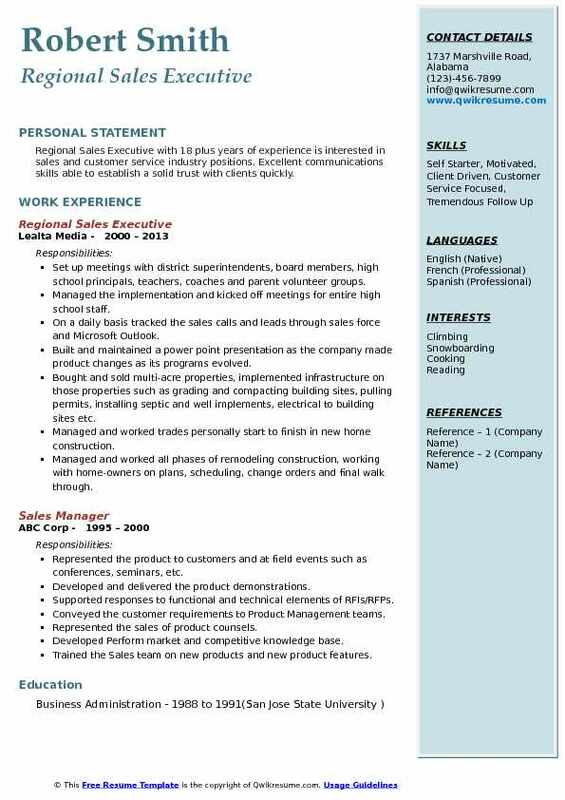 A progressive and accomplished career in sales and marketing selling broadcasting advertising, information technology software and marketing solutions to clients in a variety of industries. I offer proven success in account penetration, relationship building, and lead generation. Each year I strive to achieve or exceed company's goals. Installing and maintaining atm-like sample machines at internal/family/urgent care physician offices. Managing the east coast established accounts and making sales calls to increase territory install base. Increasing the utilization on over 48 medications across 18 therapeutic classes. Encouraging the physicians to promote our adherence management and home delivery programs. Conducting sales presentations to insurance companies and large medical groups to solicit new business and improve relationships. Increasing the prescribing habits of behavioral health medications to the top 100 psychiatrist offices. Top sales executive nationwide earning the top bonus each quarter since 2006. Leading all sales executives by converting the most accounts to be very profitable for the company by increasing prescriptions of generics, bringing more customers on to mail order pharmacy and overutilization of our sampling system. 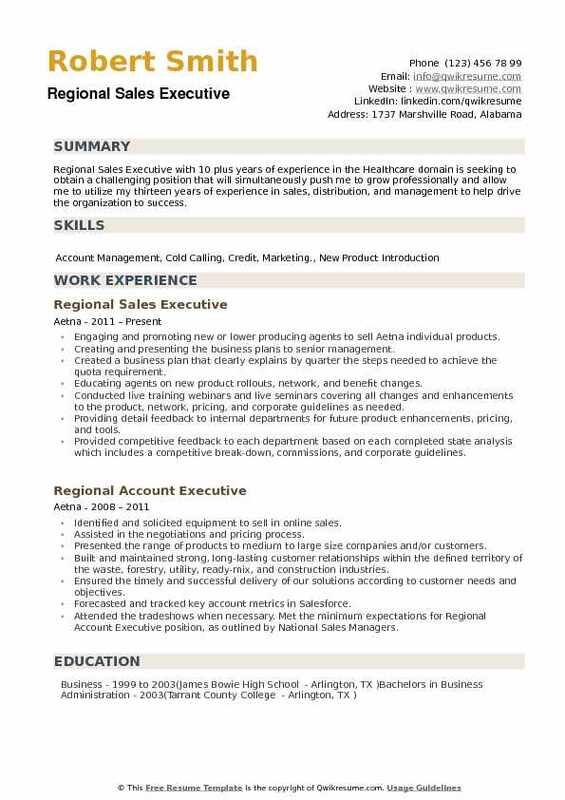 Summary : Regional Sales Executive with 10 plus years of experience in the Healthcare domain is seeking to obtain a challenging position that will simultaneously push me to grow professionally and allow me to utilize my thirteen years of experience in sales, distribution, and management to help drive the organization to success. Engaging and promoting new or lower producing agents to sell Aetna individual products. Creating and presenting the business plans to senior management. Created a business plan that clearly explains by quarter the steps needed to achieve the quota requirement. Educating agents on new product rollouts, network, and benefit changes. Conducted live training webinars and live seminars covering all changes and enhancements to the product, network, pricing, and corporate guidelines as needed. Providing detail feedback to internal departments for future product enhancements, pricing, and tools. Provided competitive feedback to each department based on each completed state analysis which includes a competitive break-down, commissions, and corporate guidelines. Actively managing the competitive position for the region and provide recommended adjustments. Communicating the corporate values and direction, continuously reinforced the corporate vision and values. Mentoring and collaborating with peers, daily operations for each region often present unique and challenging demands.